Human Alloy Rigged Models Want moving characters in your animation? Our Rigged N’ Skinned models are what you need. They come in 2 mesh resolutions: ~40K poly’s to ~70K poly’s with both a high as a low resolution hairdo. For 3ds max a biped and CAT rigged version is included and for all other packages a .FBX file is available. 8K Diffuse Texture Up to 10 different masks (for recoloring your model’s clothing for example) Up to 10 separate shaders. Every surface of the model has realistic shaders to make them react to light as they should including an SSS shader for skin. Normal maps So even the lowest resolution mesh looks almost as good as the highest but at a fraction of the RAM needed. is geometry and texture under the jacket? Is it possible to remove the jacket and have that guy just with a shirt? Hello, Unfortunately not, given that the jacket is part of the 3D scan. 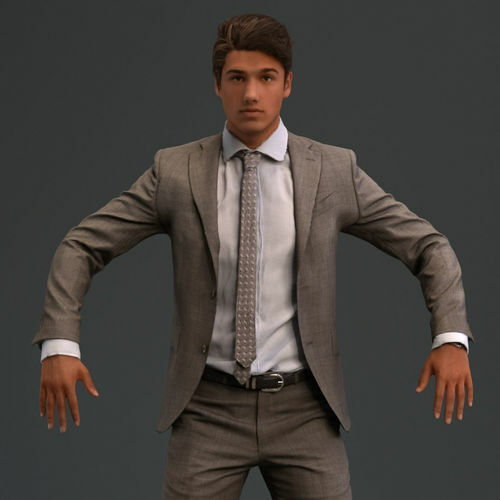 Let us direct you to one of our Rigged 3D models without a jacket: https://humanalloy.com/shop/00083ewoud001_rigged/ We hope this is useful!